February 2018. Infertility is a major negative side effect of chemotherapy. Scientists at Goethe University and Tor Vergata University in Rome have managed to decipher the detailed mechanism of how chemotherapy causes infertility in women. The mode of action of many cancer drugs involves DNA damage. Cancer cells are more sensitive to DNA-damaging substances as they divide more frequently than most healthy cells. However, female oocytes are also particularly sensitive to DNA damage because in order to minimize gene defects in offspring, oocytes enter programmed cell death when DNA damage occurs. Programmed cell death, also known as apoptosis, is regulated in oocytes by the protein p63. This protein occurs in an oocyte-specific form and at a high concentration in oocytes. It functions as a quality control factor and plays a key role in the chemotherapy-induced infertility. In contrast to men, who produce new sperm continuously, women are born with a finite number of oocytes. The depletion of this ovarian reserve determines the onset of menopause. The same happens when the oocytes are decimated through chemotherapy and menopause starts prematurely in these patients. It is assocated with hormone-related problems, such as osteoporosis, in addition to infertility. 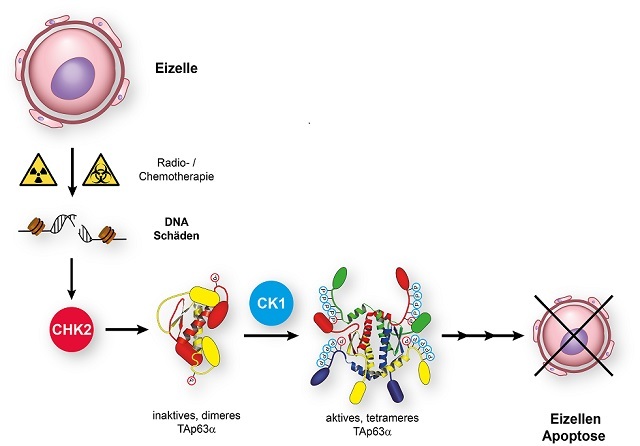 The study, led by Volker Dötsch from the Institute of Biophysical Chemistry and the Buchmann Institute of Molecular Life Sciences at Goethe University Frankfurt, uncovered the mechanism that leads to the premature death of the oocytes during chemotherapy. The protein p63 occurs in healthy oocytes in an inactive conformation. DNA damage caused by systematic radiotherapy or chemotherapy leads to modification of p63 with phosphate groups and to its activation. Active p63 turns on a programme that leads to cell death of the oocyte. Published in the online version of the journal Nature Structural and Molecular Biology, the study elucidated the molecular details of the activation and identified the enzymes participating in the p63 activation mechanism. The new research provides insights into possible new treatments to avoid infertility. When the identified key enzymes were blocked through the use of inhibitors, oocytes of mice remained intact during treatment with chemotherapy drugs. "This result forms a basis for the development of potential drugs to protect the oocytes of women during chemotherapy and to suppress the premature onset of menopause", explains Volker Dötsch.